This piece was commissioned by an admirer of Randy Groves' works. The collector had just returned from the Gettysburg battlefield and was impressed with the area of Pickett's Charge. His guide had told of the number of Confederates shot down while trying to get over the fence at the Emmitsburg Road. The figures are carved in Butternut and the fence is Cedar constructed in the way of farmers of the period. All are mounted on a Walnut base with a brass title plaque. This piece was inspired by the countless instances of friends or brothers encountering one another on the battlefield on opposing sides. 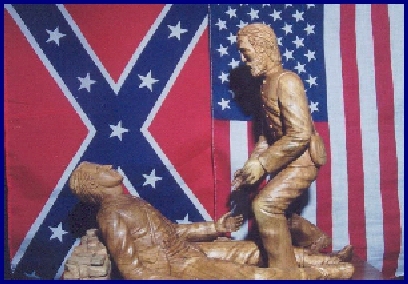 In this instance, a Union soldier has come across a mortally wounded Confederate...his brother. The wounded man appeals for aid although, both know there is no hope. The figures were carved in Butternut wood and mounted on a Walnut base with a brass plaque bearing the title. The piece is part of a private collection in Canada. Pickett's Charge took place on the third day of the battle of Gettysburg. The object of the charge was to converge on a low stone wall after crossing a mile of open ground. Although a small number of Rebel troops survived to reach the wall, they were too few and unsupported to remain. 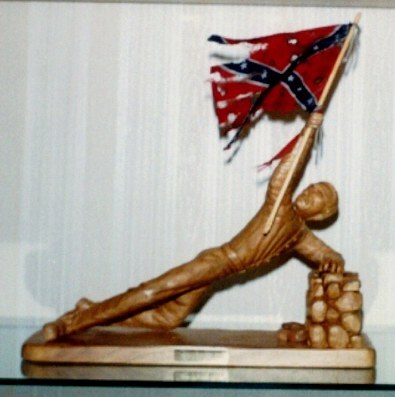 This piece depicts a wounded Confederate flag bearer who has managed to drag himself to the wall and is urging his remaining comrades forward. 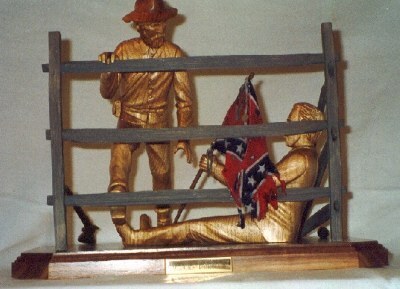 "High-Water Mark" is in a private collection in Virginia.